Agrotechnomarket.com - Today’s food and agribusiness managers operate in a rapidly changing, highly volatile, international, high technology, consumer-focused global. Agribusiness Management Book helps prepare students and managers for a successful career in this new world of food and fiber production and marketing. This book uses four specific approaches to help readers develop and enhance their skills and abilities as agribusiness managers. First, it offers a contemporary focus that reflects the problems that agribusiness managers face today and are likely to face tomorrow. Second, the book presents conceptual material in a pragmatic way with illustrations and examples that will help the user understand how a specific concept works in practice. Third, the book has a decision-making emphasis, providing contemporary tools that readers as a leader will find useful when making decisions in the contemporary business environment. Finally, Agribusiness Management Book offers a pertinent set of discussion questions and case studies that will allow the reader to apply the material covered in real-global situations. 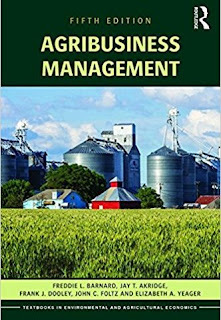 This fifth edition of Agribusiness Management Book has been updated throughout and continues to give students, businesses, practitioners, policymakers, researchers and adult learners with an essential understanding of what it takes to be a successful agribusiness manager in today’s rapidly expanding, highly unpredictable marketplace. ‘This textbook has stood the test of time and is still the gold standard for an introductory textbook on agribusiness management. The book remains practical, hands-on, and easy-to-read. Teachers in a two or four-year program will find this book useful.’ ― Dr Michael Boland, University of Minnesota E. Fred Koller endowed professorship in agribusiness management and information technology, USA. Freddie L. Barnard is Professor in the Department of Agricultural Economics at Purdue University, USA. Jay T. Akridge is the Glenn W. Sample Dean of Agriculture at Purdue University, USA. Frank J. Dooley is Vice Provost for Teaching and Learning and Professor in the Department of Agricultural Economics at Purdue University, USA. John C. Foltz is Dean for the College of Agricultural and Life Sciences at the University of Idaho, USA. Elizabeth A. Yeager is an Assistant Professor in the Department of Agricultural Economics at Kansas State University, USA. 0 Response to "Agribusiness Management Book (Routledge Textbooks in Environmental and Agricultural Economics)"